We manufacture and export a superior quality range of hydraulic lifts that includes jumbo scissor, scissor lift, shop floor lift etc. Our range of lifts are suitable to move loads to different levels and weight from ground level to the machine height or to different floor levels. Available in various capacities, these lifts are also customized according to clients' specific requirements and demands. 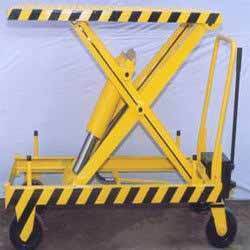 We are one of the leading manufacturer and exporter of Scissors Lifts, which are used for transferring the goods or products from one place to another place. 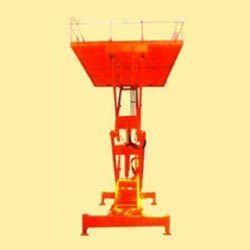 These lifts are manufactured as per the given information by our clients and these have sturdy construction. We offer these products with excellent qualities like reliability, easy to handle, better performance and long lasting. Our range of scissors lifts includes Car lifts, hydraulic scissors lifts, movable Scissors lifts, conveyor lifts and Multi-stage Scissor lifts. 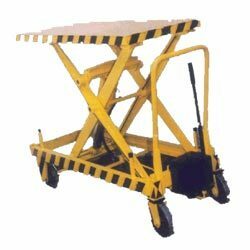 Constructed to be heavy duty and high capacity, our range of hydraulic scissor lifts is high in quality. 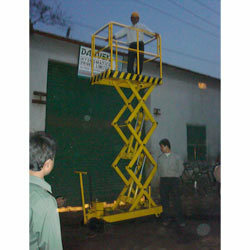 These hydraulic scissor lifts are highly acclaimed in the market because of their reliability, durability and performance. It has capacity of 1 ton. Lift for maintenance and scissor lift for shop floor maintenance mobile type with screw jack arrangement. Shop floor lift for loading unloading of die from press, storing of materials, movement of materials in different section. Height : lift up to 2 to 3 mtr. Looking for Hydraulic Scissor Lifts ?